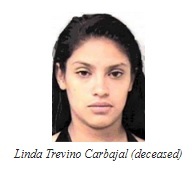 On April 19, 2004, the body of 21-year-old Lubbock resident Linda Trevino Carbajal was found along a rural dirt road in northern Lubbock County. Carbajal had suffered blunt force injuries and had been strangled. Investigators believe that Carbajal’s murder is linked to the July 15, 2003 death of Cynthia Palacio, which was the featured case in March 2018. Texas Rangers and Lubbock County Sheriff’s investigators are seeking information about the circumstances surrounding Carbajal’s murder, as well as Palacio’s homicide. As part of a DPS public awareness program, one case from the Texas Rangers Unsolved Crimes Investigation (Cold Case) Program is featured each month to generate new investigative leads and bring attention to these cold cases. The Texas Crime Stoppers reward is increased up to $6,000 for the highlighted case in hopes that the higher reward money will generate additional tips. The higher reward amount will only be paid if the tip is submitted before the next case is featured.